Welcome to Nick, our newest YFL instructor!!! He will be offering “Yoga for Teen Athletes” on Mon and Wed mornings from 6:45-7:45!!! This is the perfect yoga class for high school and college athletes, which will serve as a cross training for flexibility, strength, toning, sculpting, and relaxation. The student cost is $5 per class, or $45 for ten classes!!! 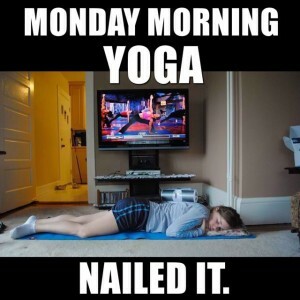 This week is Classic Hatha week for Deb’s classes!!! We will enjoy Vinyasa Power Flow!!! Our Sanskrit focus is “Prasada”, which is to sit in a state of “grace”, a gift from Source. Our hand gesture or mudra is the “Heavenly Mudra”, which promotes connection to Source and a sense of “Enlightenment”. The meditation focus is “Shanti”, or “Peace”, and is set to the music of David Lanz’s “Blue Largo”. We had a wonderful fundraiser event for Hurricane and Earthquake relief in Texas, Florida, the Caribbean, and Mexico. We shared wonderful yoga, meditation, tea, cookies, cake, and chocolate!!! I am thrilled to announce that we raised a total of $1775: $275 to Salvation Army, $1050 to UMCOR, $100 to the Humane Society, $205 to Red Cross, and $150 to Habitat for Humanity. Thank you, Thank you, Thank you for your support, donations, and participation!!! This entry was posted in Uncategorized on September 25, 2017 by Deb Potts. Greetings from YFL!!! This week we return “To the Wall and Back”!!! We will be utilizing the wall as our prop for resistance, alignment, strength, and stability!!! 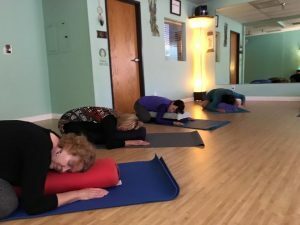 Our Sanskrit focus for the week is “Sadhana”, or the discipline of practice, and to accomplish, usually within a group setting of like-minded practitioners. The mudra focus or hand gesture is the “Let if Flow” or “Relax”. Our meditation focus will be “Let if Flow”, and is set to the beautiful music of Tom Barabas’s “Sedona Suite”…”Moon Dust”. Next week begins the Fall Session at YFL, and I am excited to announce the addition of a new instructor at the studio. Nick Angus will be joining our teaching staff. He is a 200 hour registered instructor with Yoga Alliance, and a high school student. He will be offering “Yoga for Teen Athletes” on Monday and Wednesday mornings from 6:45-7:45 a.m. So, send your student athletes to this wonderful cross training opportunity with Nick. His classes will begin on 9/25!!! Otherwise our schedule will remain the same. A reminder that Sophie and I will be hosting FREE yoga and mediation, respectively, for our Hurricane Harvey and Irma Relief fundraiser this Sunday, September 24th. Yoga is 3-4 p.m., Meditation 4-4:15 p.m. We will offer tea and cookies from 4:15-4:45 p.m. We ask that you submit your donation of choice to Red Cross, UMCOR, Habitat for Humanity, Salvation Army, etc. Donate before the event, and just slip an anonymous donation form into our jar, so we might announce the total donation raised by our fundraiser!!! We hope you can join this effort in supporting those in need throughout Texas and Florida!!! Following the fundraiser event, Deb will be hosting the Fall Equinox Drum Circle!!! It is also FREE!!! Bring a rhythm instrument and a friend, and we will meditate to the sound of our drum rhythms from 5-6 p.m.!!! This entry was posted in Uncategorized on September 18, 2017 by Deb Potts. The Triple Effect: Restore, Renew, and Relax!!! Greetings from YLF!!! We worked hard last week with weight-bearing!!! This week we experience the “Triple Effect” of Restore, Renew, and Relax!!! Yes, it is “Restorative Week on the Mat”!!! Our Sanskrit focus will be “VAYU”, or “Air, Life, Breath”. It represents the energy link to Divine energy. Our mudra for the week is the “Drum Mudra” which promotes calming of the nerves, which I think we can all use with all the recent events with weather, etc. Our music for meditation is by James Hood, and entitled “Imaginary”. I suggest a meditation focus for the week of “Just Relax”. A reminder that Sophie and I will be hosting a fundraising Yoga and Meditation event on Sunday, September 24th, for the victims of Hurricane Harvey and Irma. We are suggesting donations to the Red Cross, but please feel free to donate to any charity of choice that will help these areas of our country recover from the devastation of these two massive storms. We will begin with Yoga at 3 p.m., led by Sophie, and I will conduct meditation from 4-4:15 p.m. We will serve tea and cookies following the practice. I also invite you to stay for the FREE Fall Equinox Drum Circle, which will begin at 5 p.m. Bring your own rhythm instrument or borrow one from the studio, and Bring a Friend!!! This entry was posted in Uncategorized on September 11, 2017 by Deb Potts. Greetings from YFL!!! This week is all about “Wait for the Weight”!!! The practice will emphasize bearing of our own body weight, and light hand weights (always optional)!!! 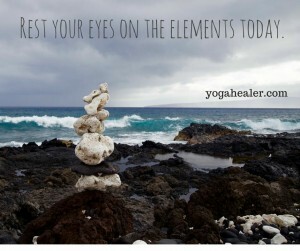 Our Sanskrit focus is “Hreem”, or the energy of the heart, Universal Compassion, and tapping into Higher Consciousness. Our hand gesture, or mudra, is “Grounding”. This hand gesture evokes connection, stability, and grounding. Our meditation focus is “Hreem”, or Universal Compassion, and may be focused upon listening to “Claire de Lune”. Sophie still has a few spaces left for her Ayurvedic Transformation 4-week series for your total well-being. The cost is $99. Start date is 9/11 at Noon. Please register via email, drop-in, or calling YFL. 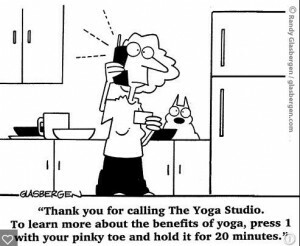 Deb will begin her next Intro to Yoga on 9/12 @ 7:30. We will meet for four consecutive Tuesday evenings, and the cost is $40. Please contact us to pre-register for either or both of these events. Deb and Sophie will be hosting a fundraiser event for the victims of Hurricane Harvey in Texas. Sophie will lead an hour yoga practice, Deb a 15 minute meditation, and it will be followed with tea and cookies. The time is 3-4:15 p.m. on Sunday, 9/24. We ask that you donate to Red Cross, UMCOR, or any other charity of your choice on behalf of the hurricane devastation. We thank you for your support in advance!!! This entry was posted in Uncategorized on September 5, 2017 by Deb Potts.